Are you an expert fox hunter? We’ll get this one out of the way with a definite NO. I just like to do a little hunting during the summer months. But over the decades I have tracked down many things from foxes, jammers, interference, and in the shack RFI issues. I have played and seen multiple fox hunting antenna types over the decades including phased verticals and doppler types such as the dopplescan ($$$) and double ducky direction finder. In all the tape measure beam with an offset attenuator seems to be the biggest bang for the buck. The tape measure beam by wb2hol. These can be made for almost nothing using some PVC pipe and T’s, an old tape measure (Think Harbor Freight free coupon! ), and a few other odds and ends. Don’t have hose clamps? No problem, substitute cable ties, etc. One change for those to try…… There is a hairpin at the feed point of the driven element. Some some strange reason (maybe just me) but I find the antenna to work better without it. What does the offset attenuator do? 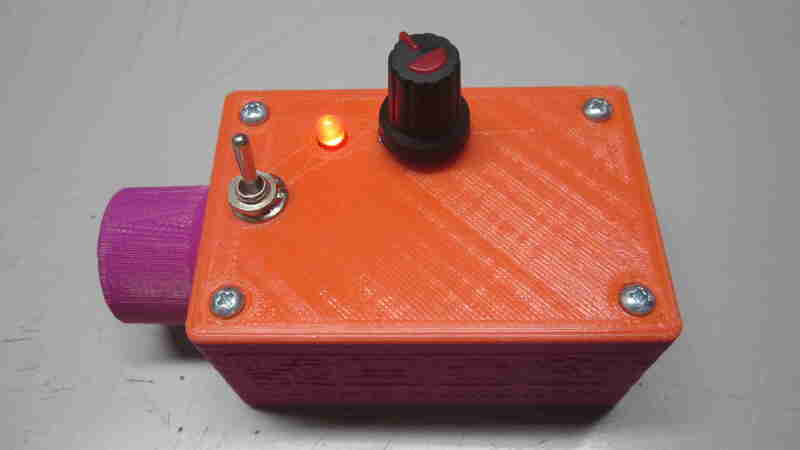 The offset attenuator is nothing more than an oscillator, 4MHz for example, and a mixer diode. The input signal from the antenna is mixed producing lower level signals at plus and minus the receiving frequency. So for example you are hunting a jammer on 146.52MHz. Just tune your radio to 142.52MHz or 150.52MHz and start swinging the beam. The attenuator has a potentiometer to raise or lower the amount of drive going from the oscillator into the diode. This in turn raises or lowers the offset frequency signal level, in cases to almost zero! In other cases the signal can still be too strong, especially when your within feet of the fox box. In that case keep tuning up or down in multiples of 4MHz (138.52, 134.52, 130.52 or 154.52, 158.52, 162.52….. in the above examples). Each 4MHz harmonic mix will be even more signal reduction. The biggest advice I can give you is to know your antenna! I use the the local Nation Weather Service radio station to learn where my beam has it’s peaks and nulls. This gives you a nice fixed location and transmission. Speaking of nulls…… you may find on some beams that the backward or side NULL makes a better detector than the forward peak. 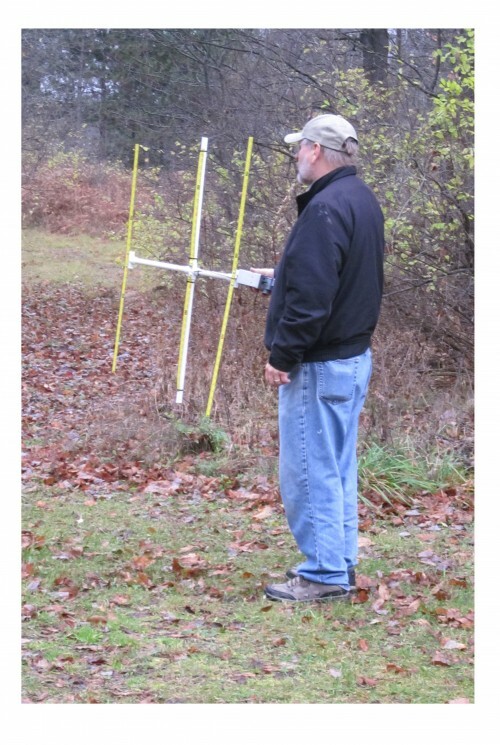 It all gets back to taking some time to lean how your particular antenna works. Need a good cheap radio for fox hunting? Check the garage sales and thrift stores for hand held programmable scanners. You can pick them up CHEAP – around $1-$10! Other advantages are they have a REAL squelch knob, non-ham/kid proof (no PTT to transmit or destroy the attenuator – perfect for scouts, etc. 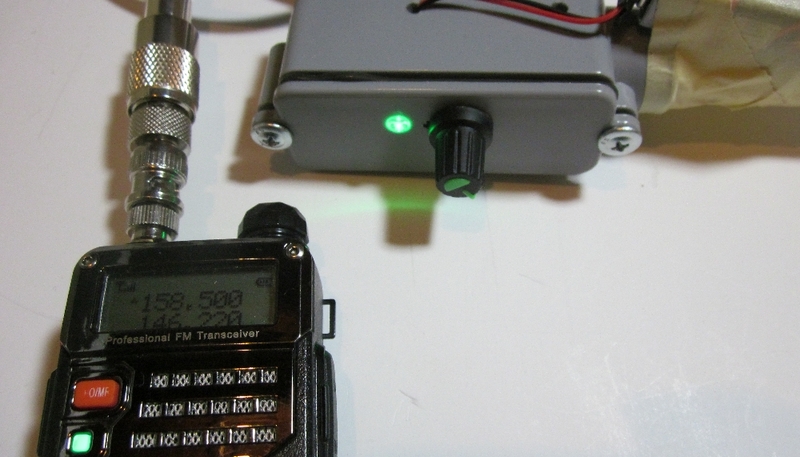 ), and pre-programming the fox frequency in 4MHz increments to quickly change attenuation levels. Did I mention dirt cheap? I have yet to pay more than $5 for them. Where can I get an enclosure for the offset attenuator? My first enclosure was an old hand me down Bud box re-purposed. You can see that in the fuzzy picture at the top of the page. The second one was hand built using aluminum flashing and a bench vise for a hand brake. It looks pretty bad, like it took a fall out of the car on I-75. So we won’t show a picture of that one! The latest V3 board is a slightly more rectangular size and fits in a 1/2″ PVC junction box available from the big box hardware stores for about $2.50. Search for UPC 0-34481-20749-8. The only downfall is there is no room for the 9V battery. Probably enough for small ones though. Dimensions for drilling and be found on the last page of the foxhunt-v5-manual manual. I prefer a good metal RF tight enclosure but this seems to work pretty good. 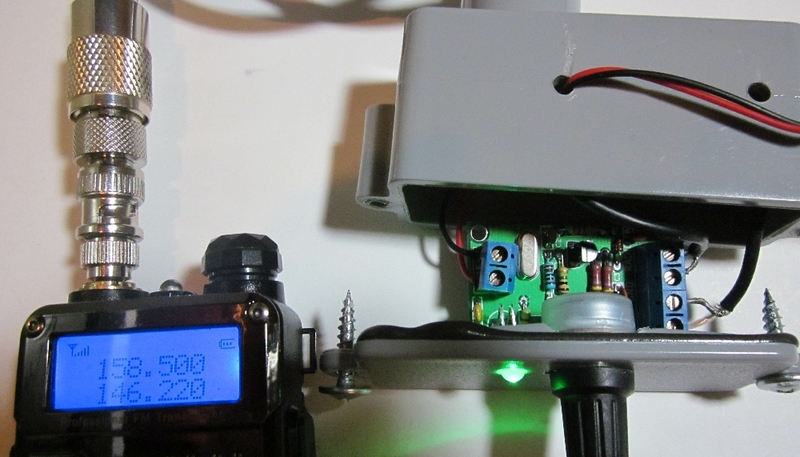 Of course if the RF is so high it’s bypassing the antenna then it’s time to switch over to the coffee can probe. Exploded view SO-239 to Radio – It’s a 1/4″ of PVC threaded onto a chassis connector and stuffed in the hole. 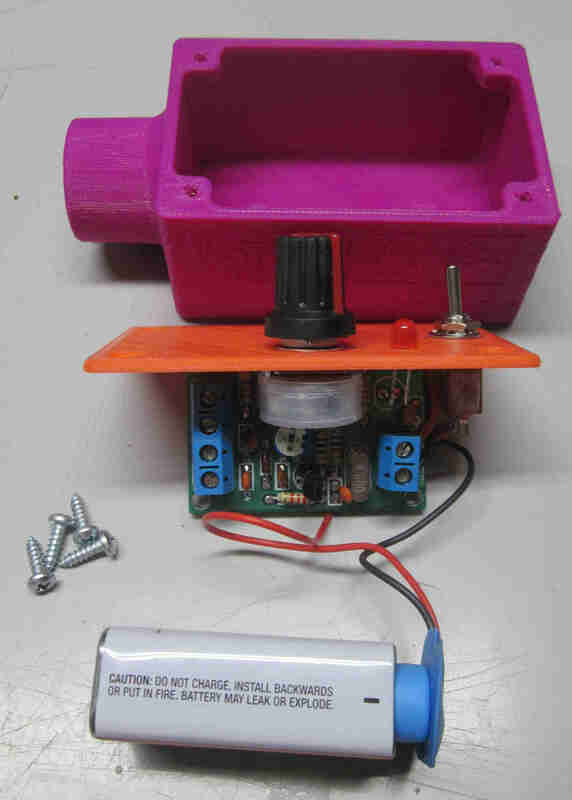 3D printed enclosure files are available! A huge thanks to Kevin N7RXE for the design and files! 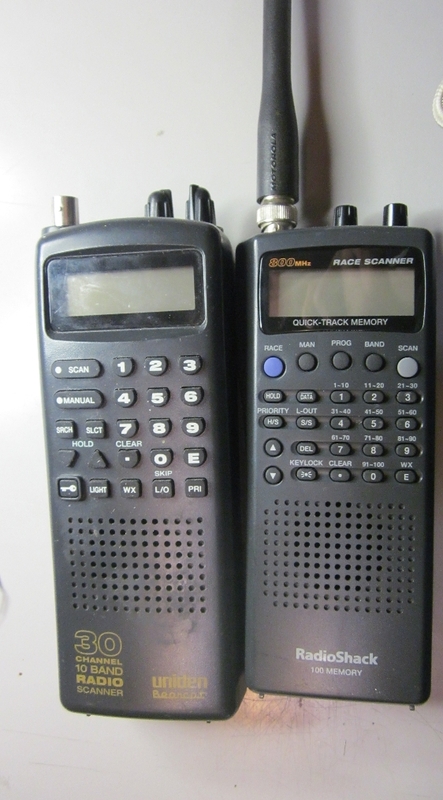 In those pictures are a Baofeng radio….. how does it work? First off, I like my Baofeng. It’s a cheap radio for the price but it has it’s downfalls. If it ever gets trashed or dunked in the lake I won’t feel as bad as dunking a $500 HT! The receiver is a bit wide and easily picks up interference. For fox hunting it’s not that great. I’d really prefer my older Yaesu which has a squelch knob where you can open the squelch all the way and listen for barely readable signals and not an automatic squelch that goes quiet on those same signals. Unfortunately, my Yeasu has become the club repeaters Echolink node. Until I can get it replaced the Baofeng will have to do. Does it work on UHF too? Yes! We have tried this out in the 440MHz amateur band as well as the FRS service area. 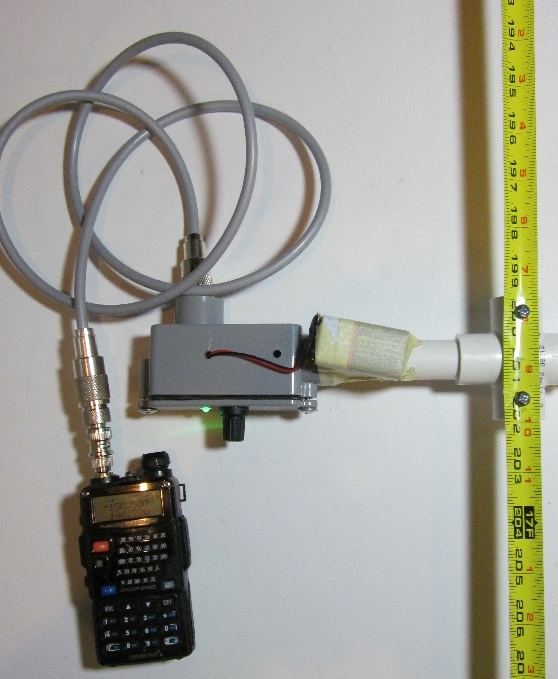 Close range attenuation offsets up to +/-24MHz work just as good in the 2M band. Your offset attenuator is not sensitive enough or too sensitive – what gives? V3 and before boards – It all depends on what you are using for an antenna and what kind of signal you are tracking (QRO or QRp). One thing you can change is R6. Reducing this value (or just plain shorting it across) will inject more drive to the mixer diode allowing weaker signals to work better. Increasing this value to 10 or 20K will reduce the drive making it work better with QRO. The current value of 4.7K seems to be just “about right” but your mileage may vary. V4 boards – This may become a 20K trimmer for course adjusting. V5 boards – The 20K trimmer was implemented! The problem appears to be differences in batches or manufacturers of MPF102 transistors. We have noticed that MPF102’s which were on tape (legs are pre-formed and spaced .1″ apart) seems to work good. But other MPF102’s (straight legs on .05″ spacing) seem to be sporadic. In my tests BOTH of these were Fairchild parts. Fortunately the solution is easy to fix. 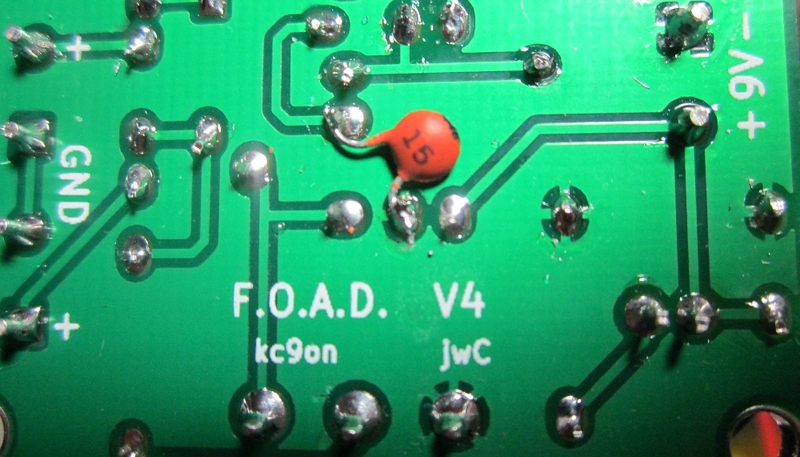 Add a 15-22pF capacitor between the MPF102 Source and ground. 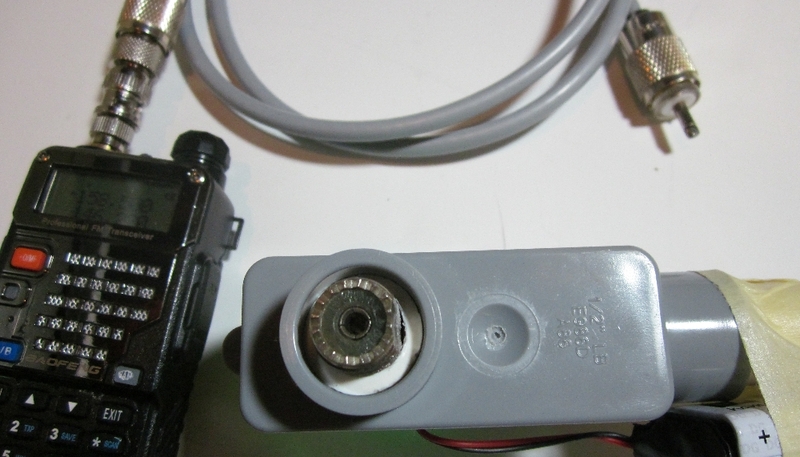 This part has been added to the second batch of V4 kits sold after 3/24/15. If you purchased a V1 through V4 board before 3/24/14 and need a cap, please let me know and I’ll be happy to send one your way! I’m real close to the fox, can’t attenuate any more and just can’t find it…..What next??? Here is a neat trick I discovered 2 weeks ago when getting ready for a fox hunt. One of the fox hunting setups is a Uniden handheld scanner that’s used so kids can hunt and not accidentally transmit. I had the antenna-less scanner sitting on the boom of the antenna right over the reflector. The offset attenuator was turned on but the cable going to the radio was not connected and hanging on the floor. When the nearby fox box was turned on I was surprised when the scanner squelch broke. There is enough mixed RF coming out the antenna end to work with the scanner. Upon experimenting it looks like this configuration with the unhooked scanner on the reflector works pretty good from about a dozen feet in! Another trick is to use a coffee can probe. Take a 3lb METAL coffee can, drill a hole for a BNC connector about 1″ from the bottom end. Add a 1-2″ piece of wire to the connector and bolt down to the can. The shielding of the can makes a nice close-in sniffer.